SAS Bombardier CRJ-900 repaint for the Raven FS Labs Bombardier CRJ-900 model. Nav lights on the wings were in the wrong position. At the same time the underwing registration was not on the right wing and was mirrored. This has now been fixed. Also. The Danish reg’ed CRJ-900 (OY-KFG) have left the fleet and is stored in Maastricht. It was the last Danish reg’ed CRJ-900 and therefore I have removed it from the zip-file. SAS Scandinavian Airlines Airbus A340-300 Fleet FSPainter for the FSPainter A340-300 base model. These are textures only. The FSPainter A340-300 base model is required. SAS Scandinavian Airlines Boeing 737-800 Winglets 70 Years FSX for the FAIB Boeing 737-800 FSX base model. Thanks to Brian Wheatley for making the blue gradient on the fuselage. Without his work this paint would never have been made. SAS Scandinavian Airlines A330-300 FSX FSPainter for the TFS A330-300 RR and the RR 242 tons base models. These are FSX textures only. The FSPainter A330-300 RR RR 242 tons base models are required. SAS Scandinavian Airlines Boeing 737-800 4.000.000 Eurobonus Members FSX for the FAIB Boeing 737-800 FSX base model. SAS Scandinavian Airlines ATR 72-600 HD FSX for the OSP ATR 72-500 base model. Includes textures for both the ATR 72-600 opb Jettime and the ATR 72-600 opb FlyBe. FS9 textures will follow soonish. 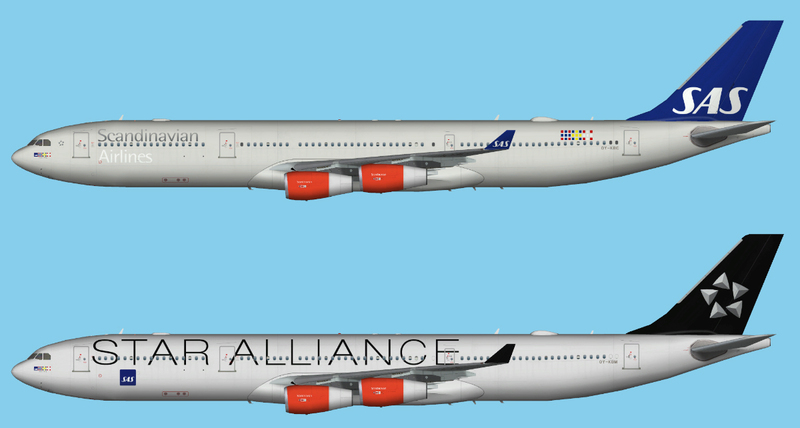 SAS Scandinavian Airlines Airbus A340-300 Star Alliance HD FSX for the TFS A340-300 base model. Version 2 updates the paint. A Shadow layer had accidently moved just as the paint was ready to be saved as DDS and TGA. I’ve fixed that. SAS Scandinavian Airlines Airbus A340-300 Red Engines HD FSX for the TFS A340-300 base model. 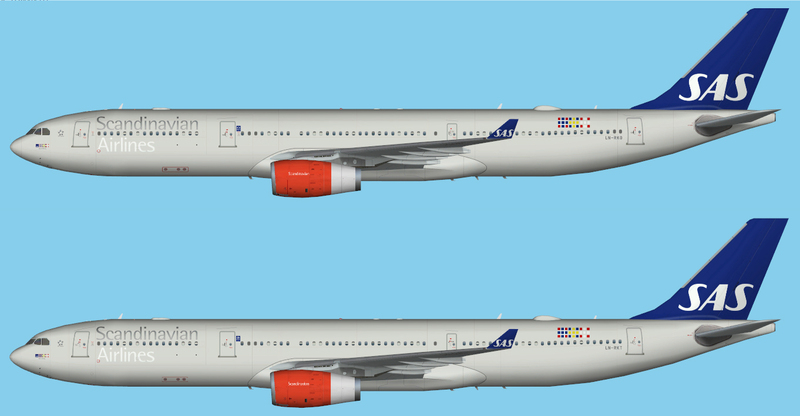 SAS Scandinavian Airlines Airbus A340-300 HD FSX for the TFS A340-300 base model. SAS Scandinavian Airlines Airbus A330-300 Star Alliance FSX HD for the TFS A330-300 base model. SAS Scandinavian Airlines Airbus A330-300 FSX HD for the TFS A330-300 base model. SAS Scandinavian Airlines Boeing 737-800 Wifi Star Alliance for the FAIB Boeing 737-800 FS9 base model. Version 2: Updates the main texture and lightmap. SAS Scandinavian Airlines Boeing 737-800 Wifi Star Alliance for the FAIB Boeing 737-800 FSX base model. SAS Scandinavian Airlines Boeing 737-700 Winglets PrivatAir for the FAIB Boeing 737-700 Winglets FS9 base model. SAS Scandinavian Airlines Boeing 737-700 Winglets PrivatAir for the FAIB Boeing 737-700 Winglets FSX base model.